: Beat... Dont do this. I dont want to fight you. : Beggin wont work, yo! : Look, I have to win! 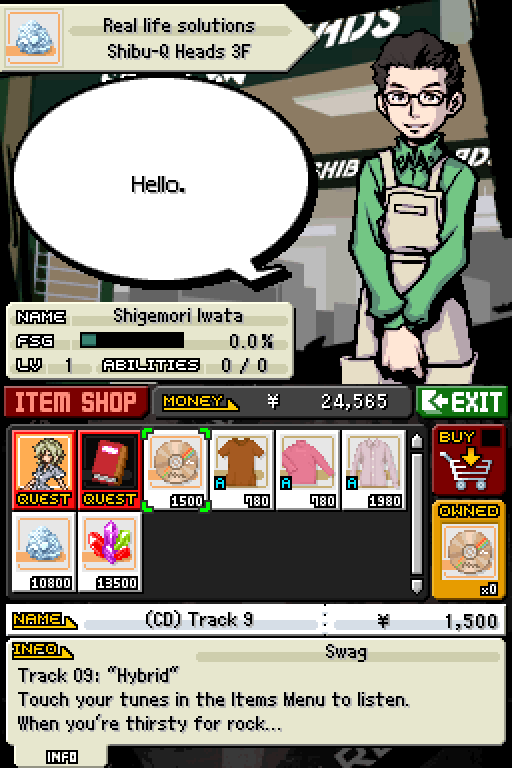 For Shiki, too! So would you please go away!? : Shut it! Les jus do this! I had it on Easy this time, so he gets blown away. 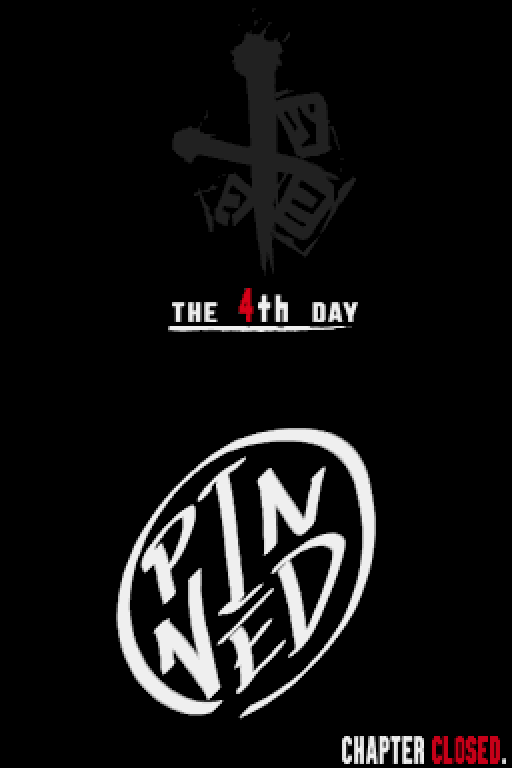 And here's a pretty interesting pin. : Yo yo yo, you even tryin? Hit harder! I barely felt that! Man, yall are stale. Next time at leas put up a fight. : Whew... That was pretty close. : Hes serious. He must really not like you. : ...... I could see him hating me. 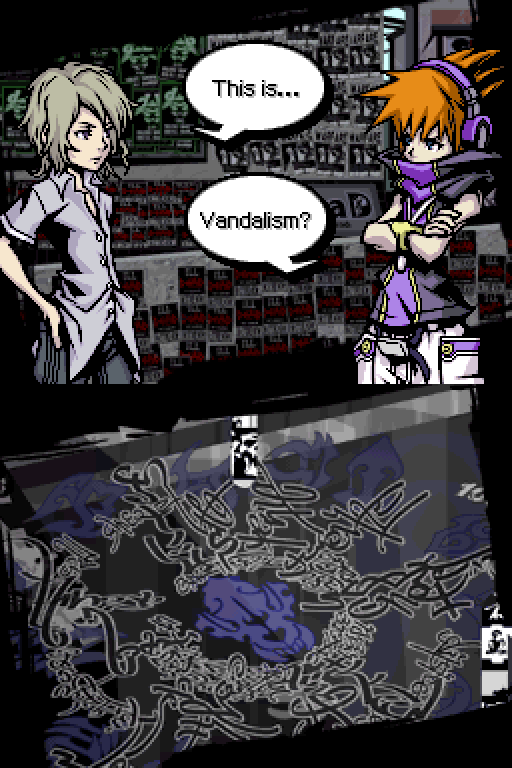 ...But why erase Shiki, too? Is he really all Reaper now? : Hmm? 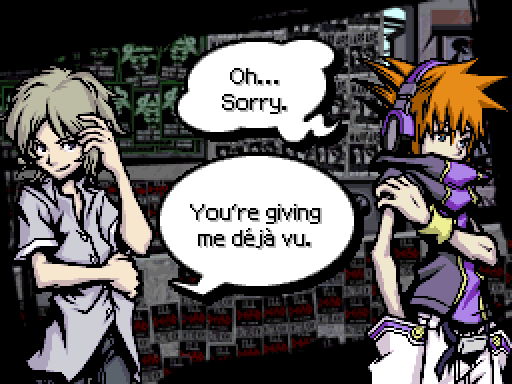 Whats this, Neku? : Beat mustve dropped it. : Hes no genius, but he mustve had a reason to join them. This meant a lot to him... I should return it. Resonance pins improve the attack of pins of the same brand. 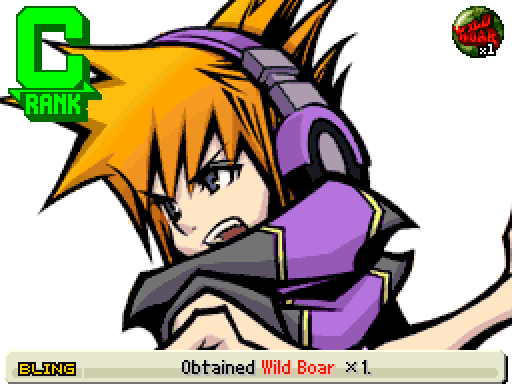 There's one for each of the 13 brands, and each are named after the brand, like Wild Boar here is. They're pretty handy if the bulk of your offense hangs on one or two powerful pins. In this case, this is the first Wild Boar pin I've found so it'll sit quietly in a corner. Also, I got Jelly off of a Jelly Swechno somewhere. On higher difficulties noise can drop these special unbranded pins. Either Reaper or Angel class, they are usually some of the top pins of their psychs. In this case, Jelly here is Discharge, which is still a crummy psych. 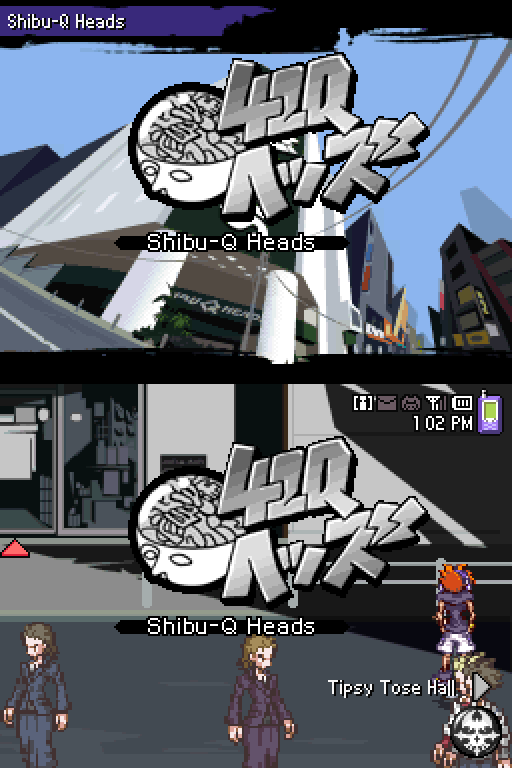 Anyway Shibu-Q Heads has four very nice shops. 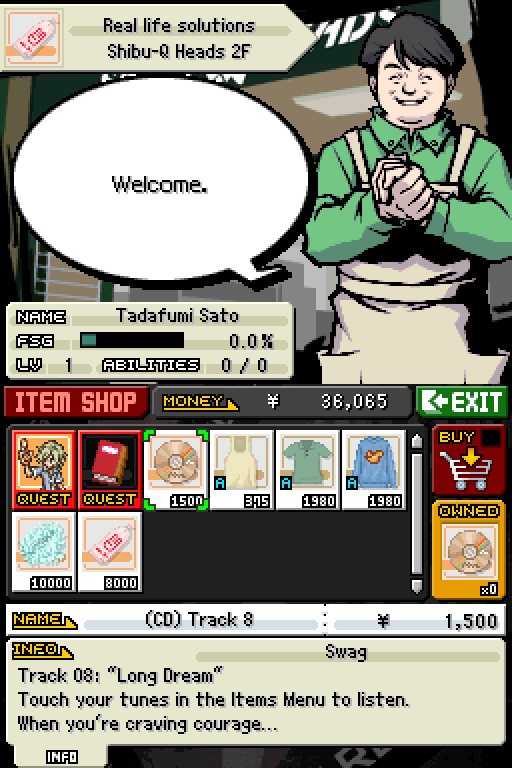 The first three are similar, each selling some upgrades - like this improved wallet with 10 times the capacity that I purchase in seconds- a CD, some clothes, and materials for yen as opposed to a quest. The ability to get stuff like leather and cotton without being bound by Rare Metal and yen pin drops is helpful indeed. Their quests are trading up materials, like rare metal for teketite. Unfortunately they don't have a Teketite to Adamantite trade or I'd be up to my neck in Adamantite AND Orichalicum already. 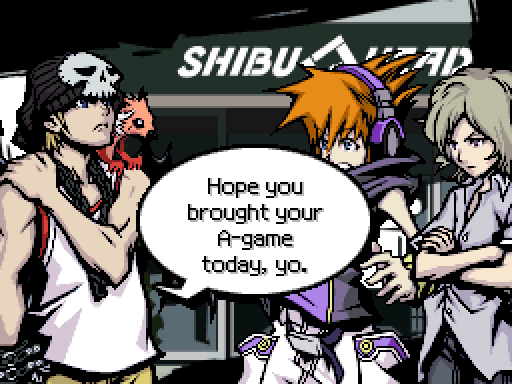 These guys are, if I recall correctly, based on the creators of the game. 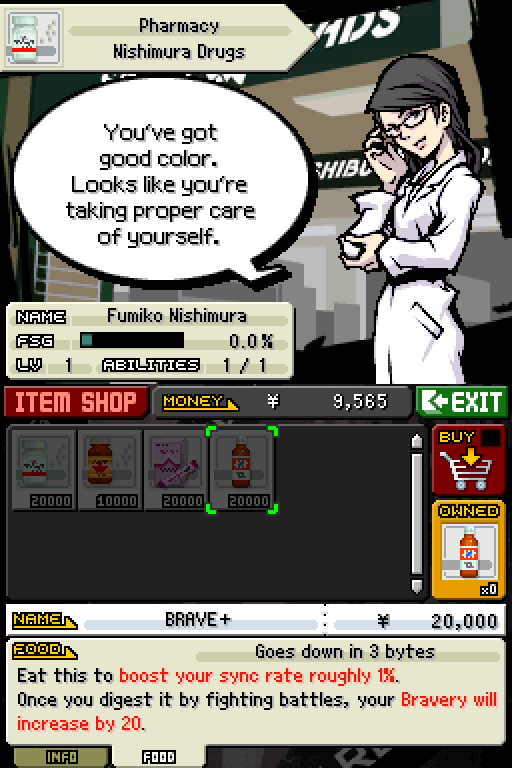 The fourth store is a pharmacy, which sells some of the most efficient foods in the game. BRAVE+ here in particular gives more Brave-per-byte than any other food in the game, and is a sure-fire way to get a dude in a dress. 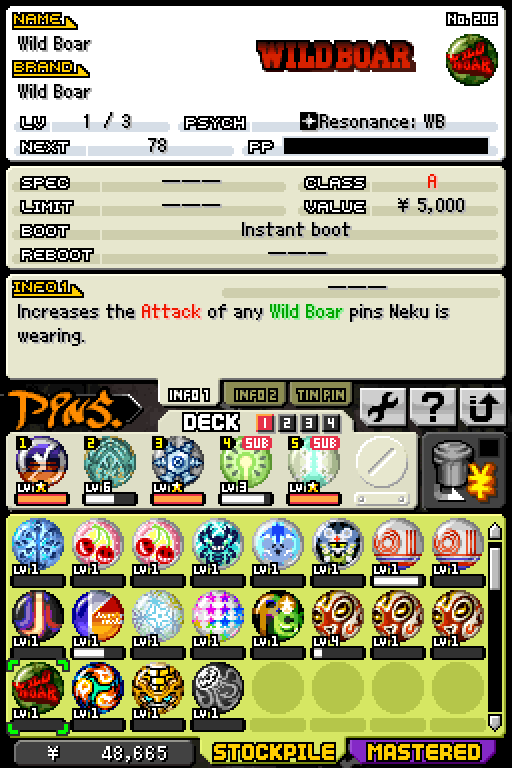 The HP, Attack, and Defense pills (ATK Capsules conspiculously absent for some reason) are also pretty good, and the Sync Bar gives a shitton of sync rate when eaten and when digested and Neku and friends just love them. 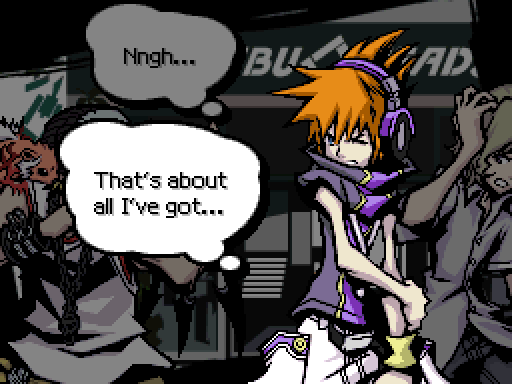 But right now, Neku is a poor person so he can't get the cool people drugs. 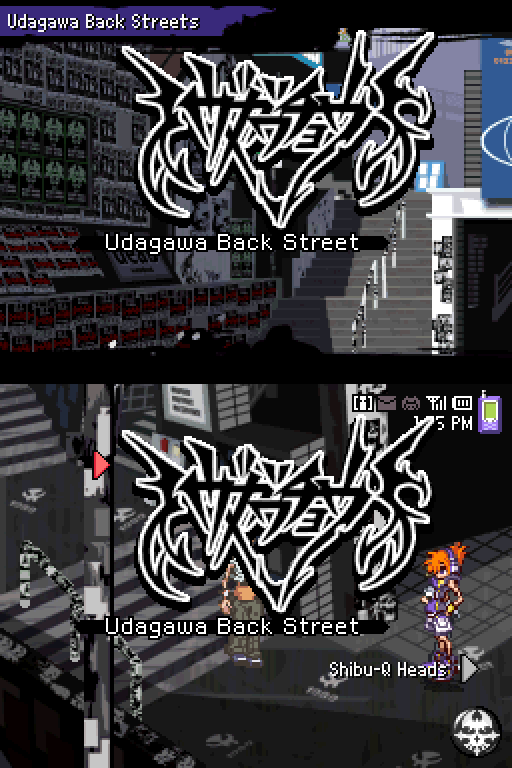 Udagawa Back Streets. 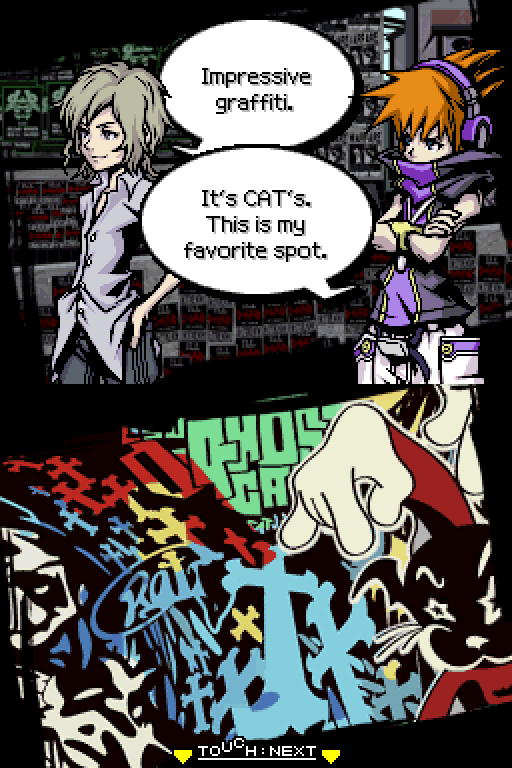 The location of CAT's biggest mural in Shibuya. 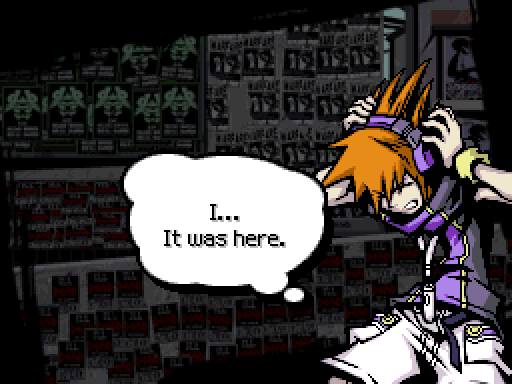 And the place where Neku saw himself in Joshua's memory. : Please. I dont do groups. I never met anyone fun to be around. : Hee hee. Me neither. We seem to have a lot in common. 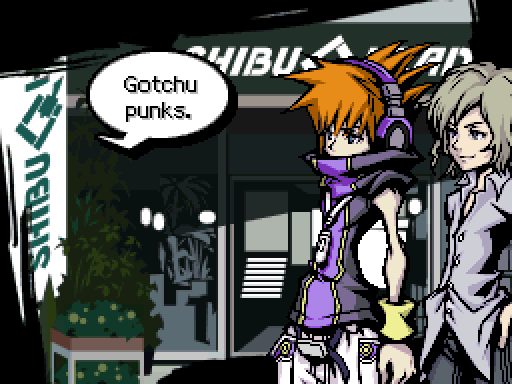 You know, Neku... Shibuyas a lot like you. Cut off. : Where did that come from? : just like its only one part of the world at large. Each UG area has unique rules. You cant travel between them. : Mr. H told you all that? : ...Oh, so you know about our conversations. : As I was saying, every area has its own rules. They never meddle with each other. Sound familiar? : That could apply to anyone. : Hee hee... Maybe so. As long as we all have our own worlds, people will never really understand each other. : Do what you want, how you want, when you want it, was it? : Absolutely. Who needs other peoples values? Its easier to just live by your own rules. : Well, we may be stuck in Shibuya. But you can still see a fair ways. 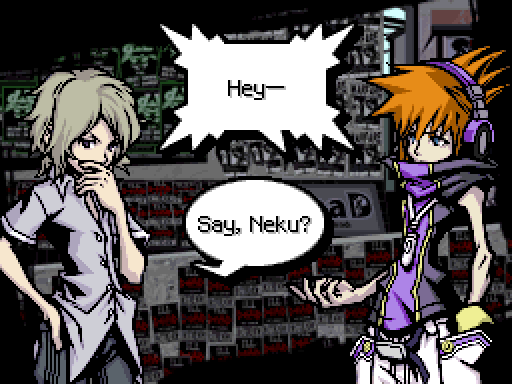 Why do you suppose that is, Neku? Why show us what we can never reach? : Hee hee. That mural you mentioned is up ahead, right? The signals coming from that direction. Lets take a look. Shibuya's third dedicated record store. It's got a few things. 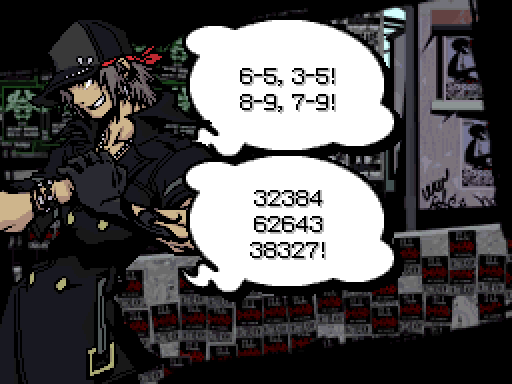 : 4 the 1-5-9 are 2.
: Shh! Lets see what hes up to. : And...perfect. Soon... Soon Ill have my desired solution. 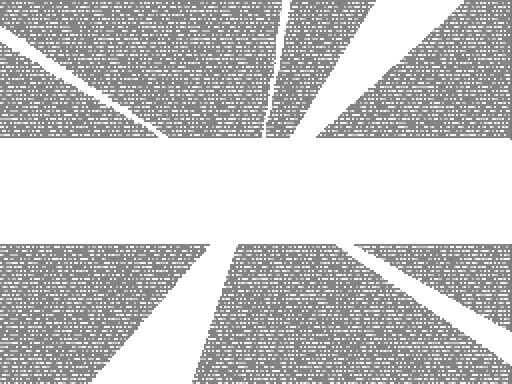 Minamimoto, his work apparently done, leaves. : What was all that about? : He drew it just now, right? More of his loony art? : I wonder... My phones responding to it. : To these scribbles? 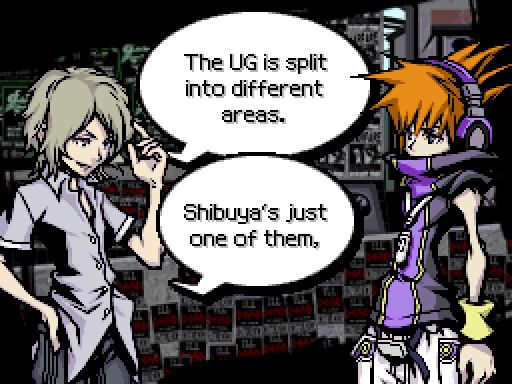 I thought you were looking for the Shibuya River. : Uhh... I dont see any rivers. 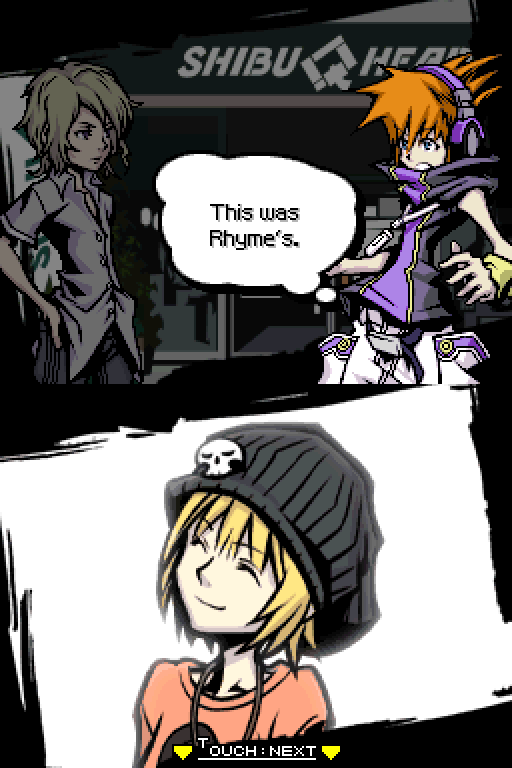 : Thank you, Neku. ...What IS this? Considering the artist, it cant be anything good. : Well? Should we erase it? : Id like to check over by that mural. Do you mind? : Uh...sure. The weasel beat me to it... Whats he need over there? : Dont give me that! Whyd those two brats have to show up? Theyre so in the way! Why cant Math Man just let me erase them!? Whew... Anyway. What the heck was the GM doing here? Other than thinking up missions not to give. : Uzuki... Get on the horn with HQ. Now. : That!? I never knew what they looked like... So the GMs gone maverick!? 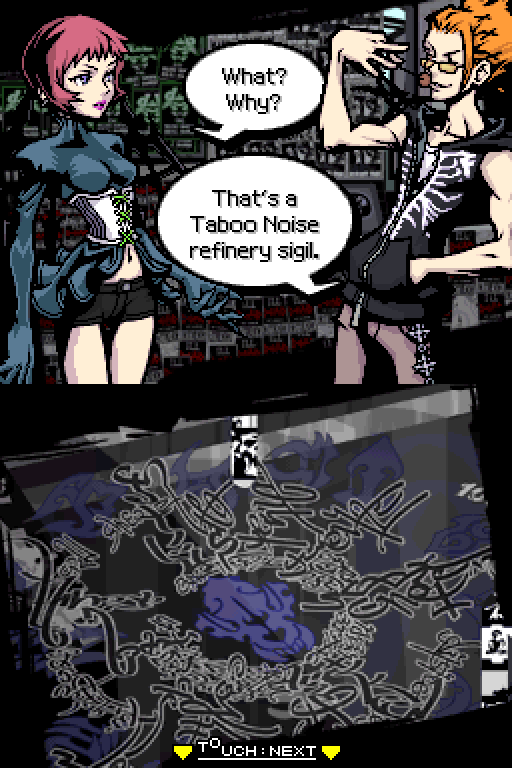 This is the source of the Taboo Noise? : Not quite. This sigil still hasnt been used. There must be another source. 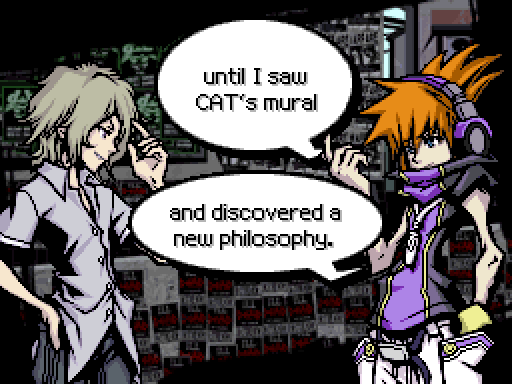 Still, we saw him draw it. Thats pretty strong evidence hes behind it all. 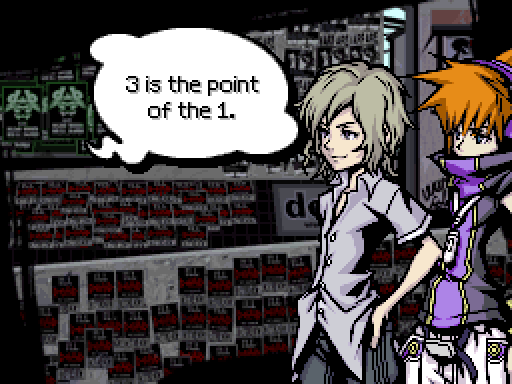 : ...Do you smell that, Kariya? Promotions! Glory! : Ill pass. 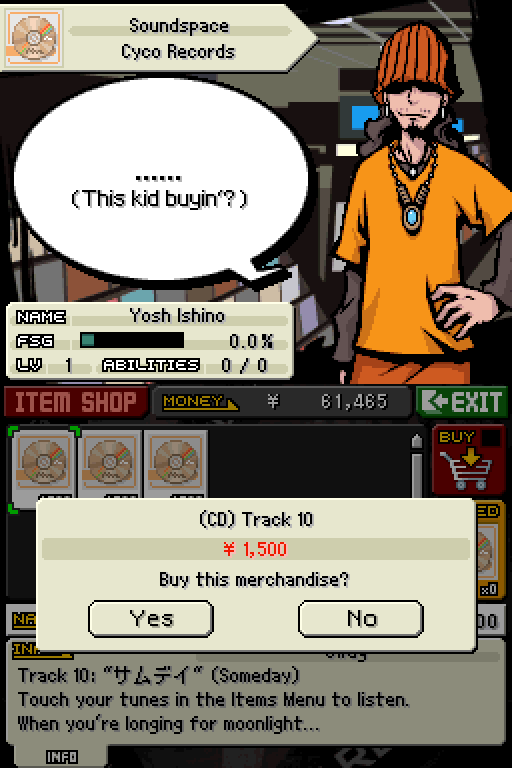 Instead of buyin me that bowl of ramen, you can just take care of the report for me, aight? : What, youre too lazy to even claim credit? : Something like that. 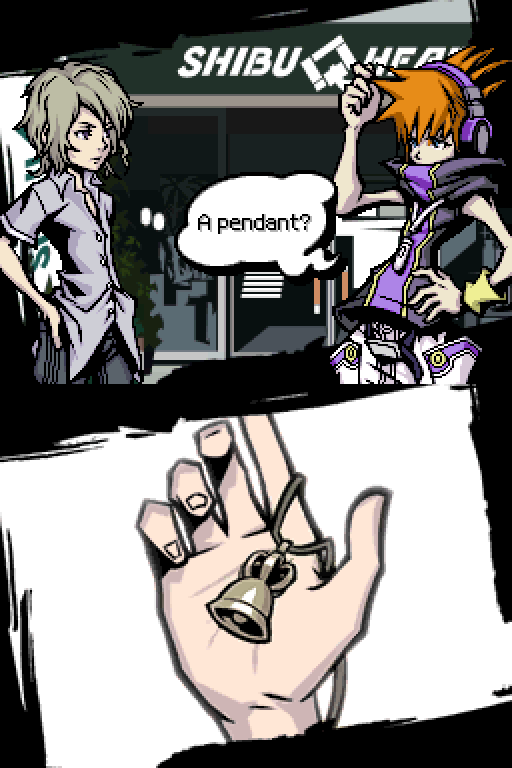 Sides...I may have another mystery to unravel. Wild Boar's other location in Shibuya is in Udagawa, and this one, unlike its 10-4 location, sells skateboards. These skateboards are fairly good accessories. 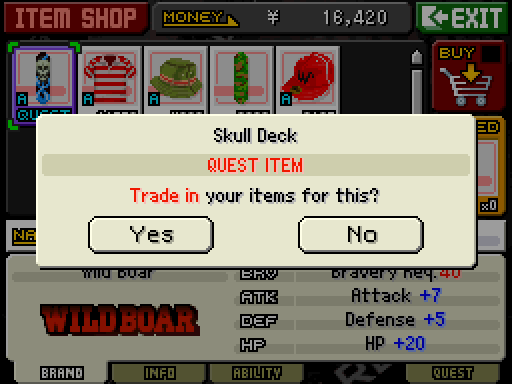 The Skull Deck has slightly better stats than Joshua's navel ring so he starts using it. It's ability is Display Time, so for a while there's going to be a clock at the bottom-right corner of the bottom screen. 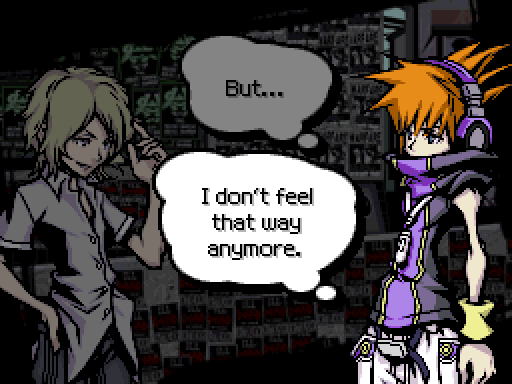 : Still with me, Neku? : What!? Déjà vu? From when? Did...did you really see me die!? 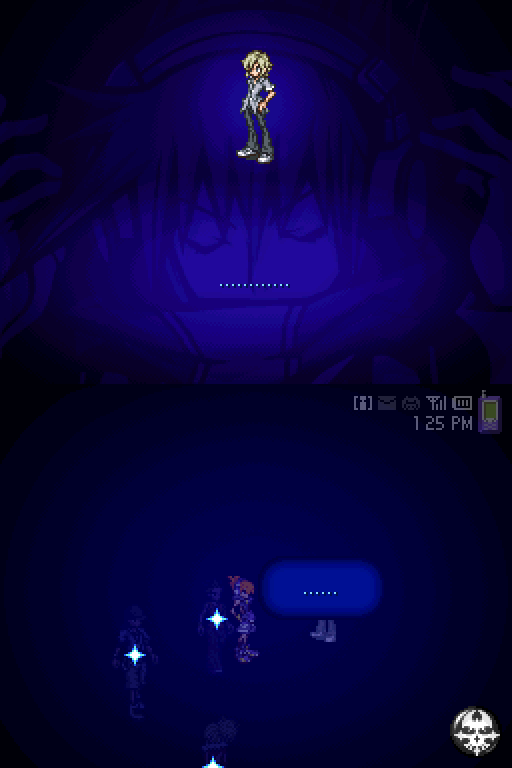 Were those scans really of... Was that my death!? ...... I have to know for sure. ...One more scan. : He... He killed me! : ...Im here. Just a little dizzy. Im fine. : Good. Lets move on. Nothing else to see here. Ugh, this trackers leading us in circles... Did Mr. H give me a dud? 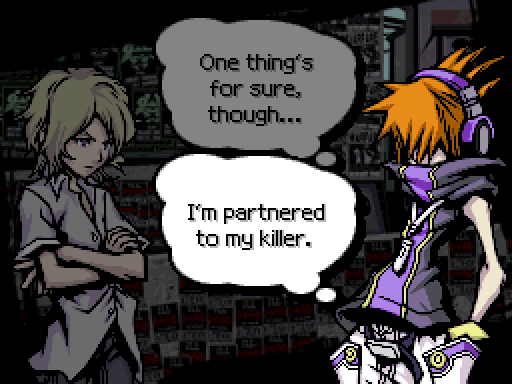 : How can he act so normal around a guy he killed? He sought me out as a partner! 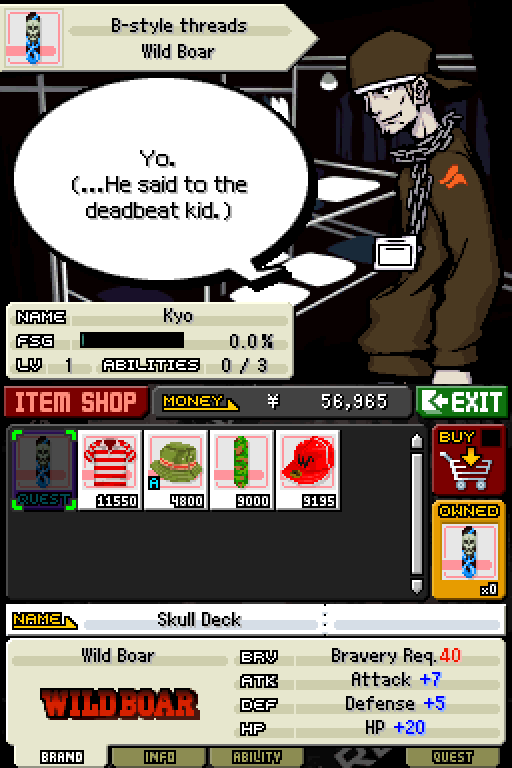 ...Hell, why kill me at all? What did I do? Did he know me when I was alive? I didnt know him. Random homicidal impulse? Ugh, he must have had a motive... Too many questions!